Insight allows you to quickly and easily copy an existing horizon. This is useful when you need to edit a horizon which you do not own or edit a horizon in another copy without changing the original horizon. There are several ways to copy a horizon. In the Horizon tree, right-click the horizon that you want to duplicate. A new horizon with the label Horizon (Copy) will be available in the tree. 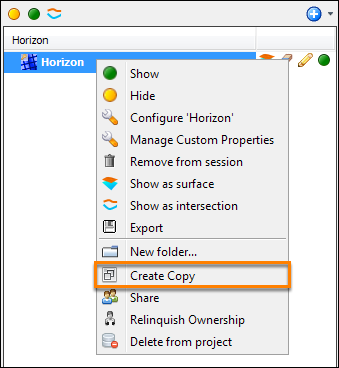 When you want to edit a horizon which you do not own (hence, no editing rights), you can choose to make a copy of the horizon instead. Load a horizon or add a horizon (that is not owned by you) into your project. Edit the horizon. For example, erase part of the horizon as described in Erasing a Horizon. The Unmodifiable Horizon window will be displayed.